You know what my favorite thing ever is? Roasting a whole chicken and having meat for an entire week! Unfortunately, this what not the experience I had last time I roasted a chicken. I used this tasty BBQ spice blend that I got from Organic Matters. It was so delicious that when the chicken was ready I ended up eating all the crispy, delicious skin off and then I savagely started to mow down on the meat alone in my kitchen. I pretty much blacked out and when I finally regained consciousness, half of my chicken was gone. Crap. It wasn’t the prettiest site and I am grateful that I live alone and no one else was around. Luckily I did still have half my chicken left to last me half a week of meat. One of my favorite things to do is to make a big salad so I can just open the fridge and have ready to eat food. This is a perfect situation for lunch, which I have to say, is my least favorite meal. Grrrrrr lunch! Seriously, could lunch be anymore annoying? In the middle of the day and getting in the way of me running around and getting stuff done. But lunch is important. I will give lunch that. The best way for me to succeed at my day and not to accidentally starve myself, resulting in a confused and flustered blood sugar crash, is to be prepared and have a nice hearty salad in the fridge ready to go. And that brings me to my latest creation. 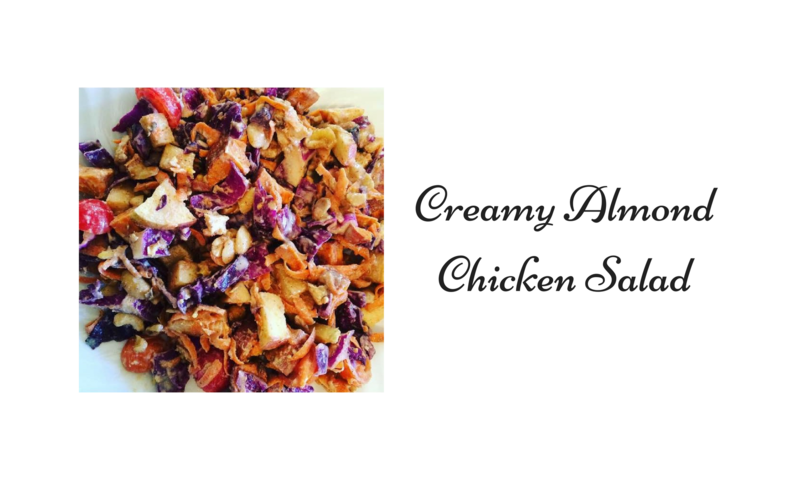 The Creamy Almond Chicken Salad. It’s tasty. I promise. Try it out.